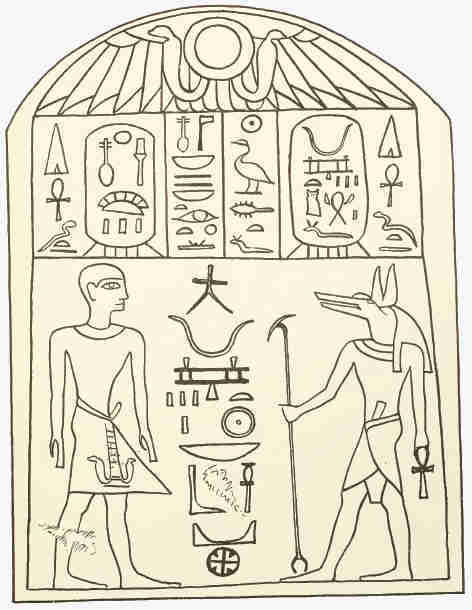 On both sides of the Stele it reads, "Pyramid supports life by absorbing negative charge into the land". The left cartouche reads "Sun Disc, projected power as electric induction supporting life to provide 'many' negative charge collections". The right cartouche reads "Heliosphere on confined plasma 'river/circuit' in space, many negative charges to seek to capacitor / double layer injection." In the center, supporting the Winged Sun, it reads: "Gods Electric Induction Supporting Life to the anode lands, negative charge attracted to anode and watched over, negative charge celestial body monitored" and then in the right central column it reads "Entrapped Sun Disc [great] negative charge injection". Next to Wepwawet at the bottom it reads, "Stars Heliosphere on confined plasma river/circuit in space, with many negative charges to the anode sun disc, Gravity supports life and dipole magnetic field acting to the core."